Two decades ago Galveston wasn’t even a cruise port. It served only as an industrial port. Today it’s the busiest port for cruise traffic outside of Florida. Each year hundreds of thousands of passengers embark from the island. Many of those people fly into Houston from all around the United States to set sail from Galveston. What surprises many of them is that Galveston is actually quite far from the Houston airports. Considering that other ports such as Miami or Fort Lauderdale are just a few miles from the nearby cruise ports, passengers often think it would be the same situation in Galveston. In fact, the cruise port is about 40 miles from Houston Hobby (HOU) and about 70 miles from Bush Intercontinental (IAH). The good news is that a number of services offer transportation between the airport and the cruise port. The bad news? There’s no “cheap” way to get back and forth. Plan to spend at least $100 round-trip, depending on how large your group is. We’ve outlined all your options below. For most people, rideshare companies like Uber and Lyft makes the most sense. You can request a car when you arrive at the airport, and it’s a fast, easy way to make your way to Galveston. It’s also one of your cheapest options unless you are traveling solo. Estimated fares from Hobby are in the $40-60 range, each way. If you are flying into Bush Intercontinental on the north side of Houston, the estimated fare is $75-100 each way. The price you pay (and the length of your ride) will depend on traffic along I-45 to Galveston. Keep in mind that this price is for up to four people in a single car — not per person. There are also larger cars available if traveling with a larger group or if you have a lot of luggage. Right now Uber and Lyft serve the Houston airports and can drop-off/pick-up in Galveston. Traditional taxi cabs are widely available at Houston airports. Estimated rates for a round-trip between Bush Intercontinental Airport is between $250 and $300. If you fly into Houston Hobby, which is considerably closer to Galveston, the rates is only $150 to $200 round-trip. These rates are higher than many other services by keep in mind that several people can ride for that price. This can make taxi cabs cheaper than some shuttles on a per-person basis. As well, you have the flexibility to make stops on the way to the port to pick up any last-minute items you might have forgot. You also don’t have to wait for a shuttle to fill up or share your ride with anyone else. Some cruise passengers prefer to let the cruise line take care of transportation. Carnival, Royal Caribbean, and Disney will all pick you up at the airport and take you to the cruise ship (and vice versa when it’s time to go home). The benefit is that you are in no danger of missing the ship. If there is traffic or a breakdown, the cruise ship won’t leave without the passenger taking its cruise transfer service. Still, it’s rare that the issue ever comes up, and in our opinion isn’t worth taking a cruise line transfer to the port. Transfers provided by the cruise line are restrictive and expensive. For one, they only leave at certain times. You may have to wait on the bus at the airport until it’s ready to depart. As well, it’s a direct ride to the cruise port. If you need to stop off on the way to the ship to get some last-minute items, that’s not possible. Finally, there is the cost. For example, Carnival charges $37/$47 each way between Hobby/Intercontinental. Other cruise lines charge similar rates. A family of four traveling back and forth between Intercontinental and the Galveston cruise port will spend $376 just getting to and from their cruise. For that reason, we suggest other modes of transportation from to Galveston, unless you are traveling in a small group. Seeing a need in the market, a number of shuttle services have popped up that provide rides to and from the Houston airports and the Galveston cruise port. While other options are cheaper for most parties, if you are traveling with a larger group then the shuttles can be a deal. Expect to pay between $60 and $80 round-trip, per person. Galveston Express: Offers both shared or private service between the airports and the cruise ship. The cheapest option is shared service, costing $65 per person roundtrip from Houston Hobby and $75 roundtrip from Bush Intercontinental. Galveston Limousine: Shared service from the airport to Galveston, departing roughly every hour. Book online ahead of time and the rate is $40 round-trip per person from Hobby and $50 per person from Bush Intercontinental. Island Breeze Shuttle: Another shuttle service with rates of $150 round-trip for two passengers between Hobby and the cruise ship. Additional passengers cost extra. Rates run $190 for two passengers needing transport from Intercontinental on the north side of Houston. The Galveston Flyer: Offers shared shuttle service between the airports and the Galveston cruise terminals for $60 round-trip per person if coming from Hobby Airport. Rates are $70 per person if catching a ride from Bush Intercontinental. Car Rentals: Want to have the freedom to explore Galveston on your own? A car rental is a good idea. This way you always have transportation — including from the airport to the Galveston cruise port. Only Enterprise has a lot on the island, so you will need to rent with them if you plan to drop the car off in Galveston. However, often they won’t allow one-way rentals from the airport (it still doesn’t hurt to check). Every major car rental company is at the Houston airports. If you can find a decent rate, it’s possible to rent the car for the entire length of your cruise and just pay to park during your trip (parking costs between $50-90 per week). Private Cars: Private cars are another option. 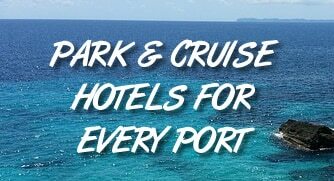 There are numerous private car/limo services around the area that are happy to pick you up anywhere in the region and drop you off at the cruise port. These services are certainly great if you want to travel in style, but aren’t always the cheapest way to get to the cruise ship. There are dozens of services that provide private cars, and costs can range from $150 round-trip to several hundred dollars, depending on the car you wish to use. While the headline price may be higher, it is often cheaper to go this route when dealing with larger parties. We can’t list all of the private services, but what follows are some of the more popular ones. If you search around, you might find others that have lower prices for the specific level of service you’re looking for. Companies offering transfers from Houston airports to the Galveston terminal: Galveston Limousine, Galveston Shuttle, Karr Limousine, Elite Limousines, Aim Limousine. Thanks for sharing this. Any updates on using Uber here? I know sometimes the dropoff at the Houston airport is challenging because they’d rather give the space to the cabs. Curious if the dropoff is any better? I would like to use Uber or Lyft from Hobby airport to Galveston for cruise. I have an original I phone and it won’t let me download their apps. What else can I do? Unfortunately you have to download the app. Are you traveling with another person? Can they download on their phone?